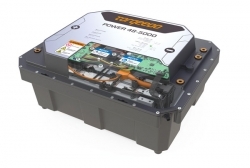 Torqeedo has announced a new 25kW range extender for its Deep Blue Hybrid propulsion system, optimised for commercial operations and applications that require extended motoring and developed in cooperation with WhisperPower. The 350V DC converter generator boasts a Mitsubishi S4Q2 four-cylinder diesel engine with crankshaft starting. According to Torqeedo, the range extender’s variable-frequency operation “eliminates the fixed ratio between power, voltage output and rotational speed and produces all required combinations of power and voltage on demand”. 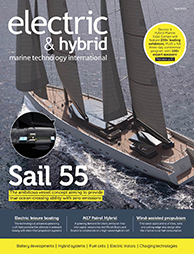 These power electronics also allow the engine to “run at its most efficient operating point, minimising fuel consumption, noise, vibration and exhaust”. The range extender consumes 295g of fuel per kWh of electricity produced and generates just 54 decibels at 23ft (7m) distance. When integrated into Deep Blue Hybrid, the range extender helps the system harvest renewable energy from solar panels and hydrogeneration to charge high-capacity batteries, manufactured by BMW i. The Deep Blue electric motors, plus all hotel loads, including air-conditioning, are powered from these sources. When long-range motoring is required, the generator is controlled automatically by an Advanced Hybrid Control System, which also ensures backup power.